A few key points to be wary of when operating a granulating machine - Wuxi Huamu machinery Co.,LTD. (2) Purpose of feed adjustment: a. Improves production efficiency; B. Extends the service life of the ring-die; C. reduce energy costs; D. Gelatinizes starch to improve nutritional value. (3) The water in the powder is increased by 1% every time the temperature increases by 15 ℃. The time required for normal livestock and poultry material is 25 to 40 seconds, and fish is more than 60 seconds. (4) During the production of high milk powder content or high protein feed, the temperature control is between 60 ~ 65 ℃. Water should be controlled at 13% ~ 14% after quenched and tempered. When producing low quality pig feed, the temperature control should between 70 ~ 82 ℃ in summer and between 70 ~ 74 ℃ in winter, water should be controlled in 15% ~ 16% after it is quenched and tempered. When producing ordinary pig and poultry feed, the temperature should be controlled at 82 ~ 88 ℃ and moisture should be controlled between 16% ~ 17% after it is quenched and tempered. When producing dairy cow feed, the temperature control should be between 60 ~ 62 ℃ and the moisture should be controlled at between 12% ~ 13% after it is quenched and tempered. First, check the schedule of the class, then thoroughly clean the cooler, windpipe, pipe, and internal residues of the granulator (cleaning the inside of the granulator only before night shift). According to the production variety, the coarse granulator cutter, check or replace the grading sieve, and if the crushing material is produced, the clearance of the crusher are also required to produce qualified products. Check the guiding knife, scraper, roller, ring-die and guide knife position. 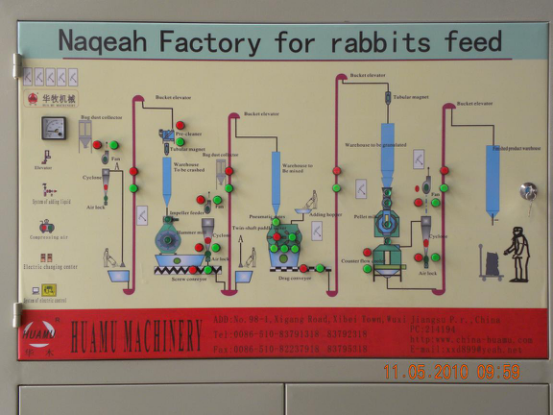 When you start to use the machine, reduce the steam and slow the production rate. After running for an hour, it can complete the grinding period, then adjust the gap between the roller and the annular mode to make the ring mode idle and until the rollers stops. At this point, the preparatory work is basically complete. The improper operation of this process will directly affect the output and product quality of the whole production shift. In order to prevent blockages, the relevant equipment is used from the following sequence according to the process flow. Observe the granulator ammeter. If the current meter is no longer swaying back and forth, the whole system is in its best stable condition. Use 10 minutes to clean the work environment around the granulator to keep clean. Check the temperature of the granule, take the feed for durability test and check the powder ratio of finished products, check the clearance of crushing roller, check whether the return tube of the centrifugal dust collector and the grading sieve is blocked. The above work must be performed every hour. Record various production parameters such as production time, material temperature, durability, powder rate, production variety, tonnage, efficiency, etc. Pay attention to the control screen, coordinate the packing and granulation so as to return to the front and back pocket in time and find all kinds of problems in a timely process to reduce loss. For example, check whether the amount of powder in the timely inspection is too high, whether there are small pieces in the material, or whether the temperature is excessive. The sequence of shutting down is the opposite of booting it up. Shut down related equipment is in the backwards sequence according to the process. When the low level of the granulator is displayed, the feeding door of the granulating machine can be opened to observe the feeding flow of the feeding material. When the material flow is significantly reduced, let the cooler manual discharge, increasing the feeding flow of the machine. This is all done so that the feed flow of the feeder can be increased to ensure the quality of the granulation. 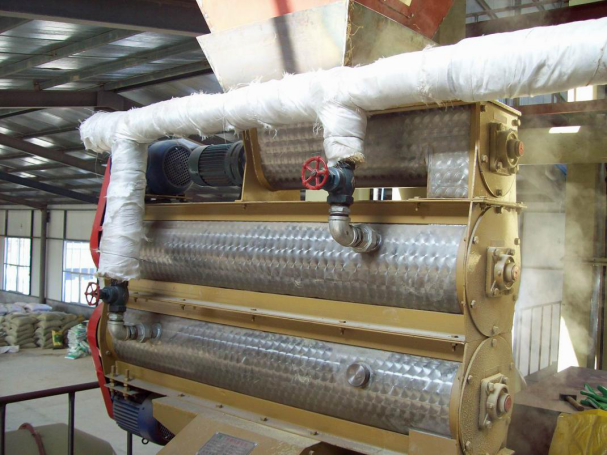 After going back to the machine with the tube material, wait a few minutes and put the remaining material in the cooler, check the granulating system processes (check the cooler, crusher, elevator, machine feed tube, centrifugal separator, if there is accumulated feed in the grading sieve). Finally, the total power supply of the granulated system must be shut down and the cleaning work must be done. The quality of the product is closely related to the individual quality of the granulators. In order to produce quality products, granulator operators must have a comprehensive knowledge of the machine, rich experience of using it, a strong sense of responsibility, and the ability overcome difficulties to produce high-quality and efficient products.